Chinese President Xi Jinping's visit to a fast-food restaurant last month was reported across the globe, and has now inspired a song too, it's reported. 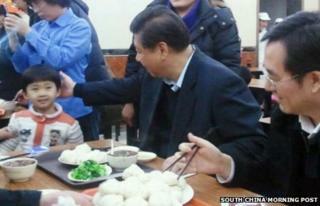 Wu Songjin, a Guangzhou-based composer, said his new song 'Pork Bun Shop' was inspired by footage of the president queuing up to order a reasonably-priced meal, according to Sichuan newspaper West China City Daily. The visit was part of the president's campaign to put his party back in touch with the people. Mr Wu says he was "moved" by the spectacle, and wrote the song with lyricist Zou Dangrong just in ten days. Three singers recorded different versions of the song, all of which were popular with customers at the Beijing shop when Mr Wu played them some samples. One customer said the "lyrics are simple, it's down-to-earth and spreads positive energy". The newspaper reports that Professor Zhao Shilin, of Minzu Central University, claimed the song was reflective of a cult of personality, and "seriously damaged the leader's image". Pork Bun Shop goes on sale at the end of January, to mark Chinese Lunar New Year. Singers from various regions of China are reportedly recording dialect versions already.